Long ago, in the beginning of time, when the world was still young … the Sun shone down from the sky, just as it does today. Each day as the Sun traveled on her journey beneath the sky vault, she looked down upon the people of the Middle World. But, as they in turn looked up at her, all she could see was the faces of the people, all twisted up … as if they were frowning. The Sun spoke to her brother, the Moon, about the people of the Middle World. She told him she thought the people were very ugly, because of the horrible frowns that they had upon their faces when they looked up at her. But, the Moon laughed. He told the Sun that he thought the people of the Middle World were quite handsome creatures, for, when they looked up in the sky at him each night, they always seemed to have a pleasant smile upon their faces. This made the Sun very angry and jealous. She grew to hate the people of the Middle World, for she thought they loved her brother the Moon much more than they loved her. She decided that she would kill all of the people … with heat, and with sickness. Each day on her journey across the sky the Sun would stop at her daughter’s house, which is in the very center of the sky vault, at the highest point. While she rested there at her daughter’s house each day, she poured down upon the people below her such great heat, that many grew sick. As day after day passed, the Sun grew even hotter. The hotter she grew, the more the people frowned up at her. The more they frowned, the hotter she grew. Soon, the people of the Middle World began dying in great numbers. The Thunders looked down upon the people of earth, and took pity upon them… for their condition was pitiful indeed. The Thunders knew if they did not do something to help the people, they would all perish very soon. They talked among themselves, and decided to change two men into great serpents and send them to kill the Sun. One of these serpents was a black rattlesnake, with a body as long as a hundred grown men lying head to toe, and as big around as a large tree. When it shook its tail its rattles sounded like thunder rolling in the mountains. Its breath smelled of death and rot, and was enough to sicken and kill a normal man just by itself. As horrible and as dangerous as the Rattlesnake was though, the other serpent was even worse. The Thunders changed the second man into a monster even larger than the Rattlesnake. They put a set of antlers upon its head like a deer, and shielded its body with scales so hard and thick that no arrow could pierce them. 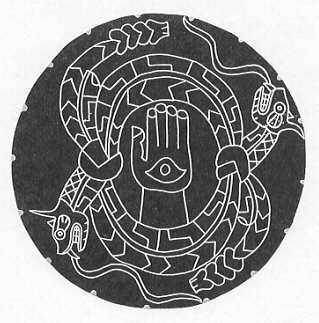 In the very center of this serpent’s forehead, they placed a third eye. Nothing, no matter how fast or how small, could hide from this eye for it was very keen and all seeing. To even look upon this serpent would cause one’s death, for the eye would shine and glitter and bedazzle, causing even the most guarded observer to fall into a stupor. Once that happened death was certain, for the jaws of the serpent were then inescapable. This great and terrible snake, this horned serpent it was the most dangerous creature to ever exist. The Rattlesnake rushed on ahead of the horned serpent, hurrying to get to the house of the Daughter of the Sun f first. It coiled itself up into a pile and hid by the doorway of the daughter’s lodge, waiting there for the old Sun to emerge and continue on her journey across the sky. But, in its haste to kill the Sun, the Rattlesnake accidentally bit the Sun’s daughter, who emerged through the doorway f first to see her mother on her way. The daughter of the Sun immediately fell dead from the poisonous bite of the Rattlesnake while the serpent crawled away to hide. The Thunders were so infuriated by the Rattlesnake’s shameful failure they began raging and thrashing about in the Upper World, causing the most dreadful storm clouds and lightning the people down below them had ever seen. At the same time, the old Sun hid her face and cried tears of grief for her dead daughter, in such abundance, that they flooded the Middle World. Soon the whole earth was stormy and dark, and in danger of being drowned. The storm raged on and on. No one could tell the days from the nights, or the nights from days, for the old Sun had hidden her face and would not shine. She only cried more and more tears. Finally, out of desperation to save themselves, the people of the Middle World held a council to try and decide what to do. They soon decided to have a dance, in hopes of getting the old Sun to look down upon them. They thought that maybe, if they could get the old Sun’s attention and make her happy for a while, she might forget about the death of her daughter. Then maybe, maybe she would quit crying. If not, they would all certainly drown. The people of the Middle World drummed and danced as the rain poured down upon them. They lifted their faces to the sky and smiled and sang happy songs in an effort to make the old Sun happy. All the while, as they danced and sang, the rain kept falling from the sky, and the angry Thunders raged and crashed about in the Upper World with their lightning. Finally, after a great effort, the people became so weary of dancing they could hardly dance any more, and they became so weary of pretending to be happy, they could hardly pretend to be happy any more. After a long while, the drummers’ arms ached and grew tired… so tired they could barely raise their sticks to strike their drums. At last, the drummers finally grew weak and began to quit. One by one they stopped, until only the head drummer remained. Just as his final bit of strength was leaving him, the head drummer changed the song he played to a very slow tempo, “thump … thump-thump, thump … thump-thump”. At that very moment, the Sun peeked out through a crack in the clouds and the rain ceased to fall. Gradually, the black clouds in the heavens parted and faded away, and the Thunders grew quiet. The people of the Middle World rejoiced. With gladdened hearts they looked up to the Sun with smiles upon their faces. Now, in the time which we live today, the old Sun still cries sometimes when she thinks of her daughter but she usually returns to being happy, after a while. And to this day, the Cherokee are careful not to frown when they look up at her. And, what became of the serpents? The Rattlesnake is still with us. Because it failed to kill the Sun, the Thunders banished it to the Middle World for all time. It has now grown quite small and much less dangerous than it was in those days. If people do not frighten it or do it any harm, the Rattlesnake will do no harm to people. And the other serpent … ? The Thunders also cast the Horned Serpent down to the Middle World, just as they did the Rattlesnake. It never grew any smaller though nor did it become any less dangerous. The Great Horned Serpent was forever destined to crawl upon its belly in the dirt of the earth, forever filled with anger and hatred. It hated the Thunders for their accursed meddling, and it despised the weak and piteous people of the Middle World for causing its predicament in the first place although at one time, it had been a man itself. This Horned Serpent was the creature that was known to the Cherokee as, the Uktena. The Uktena haunted the lonely, isolated places of the Cherokee world the bare mountain balds, the deep vine draped ravines. In death-like silence it lay along the trails that passed through the gaps of the highest mountains ranges, in those distant and lofty places where a perpetual draft swept up out of the river valleys and moaned through the scraggled, wind-twisted timber on high. With reptilian patience it waited, waiting in silence for anyone unfortunate enough to pass its way. The Uktena would sometimes lie in one place for untold ages without moving, until it was completely covered by humus, leaves and ferns until even trees had taken root upon its great body. Lying there, covered by countless seasons of fallen leaves and forest growth, a deer or a man might easily pass in front of its moss-covered head and mistake it for a rock projecting out of the leaves on some timbered slope. Its huge antlers could easily be mistaken for two dead trees. Should the Uktena be aroused, the unwary passer-by was in grave danger. Many a hunter that had never returned to his village was feared to have fallen victim to the Uktena. For, just a glimpse of the glittering eye was all that it took. Just a glimpse to get the attention and tease the curiosity, and soon, even the bravest and strongest was lured into a hypnotic stupor. Once one became transfixed by the bedazzling eye death in the Uktena’s savage jaws would soon follow. Only one person ever saw the eye of the monstrous Uktena and lived to tell about it a powerful Shawano shaman captured in war by the Cherokee. His name was Aganunitsi, the Ground Hog’s Mother. But, the story of Aganunitsi is another story unto itself. Was a Mysterious Underground Structure Found On the Moon?